Simchat Torah is in three days and I am looking forward to celebrating by dancing with the Torah. Fortunately in my neighborhood there is a synagogue that provides this opportunity. However I am aware that for the vast majority of women in Orthodox synagogues this is not an option. That is not to say that these synagogues are necessarily ignoring women, on the contrary, many of them have responded to the desire for greater female participation by encouraging shiurim for and by women, instead of Hakafot. While Torah study is very important and women’s advancement in this area is to be encouraged, I find the replacing of dancing on Simchat Torah with Torah study particularly disturbing. Shavuot and Simchat Torah are the two festivals that specifically celebrate Torah. 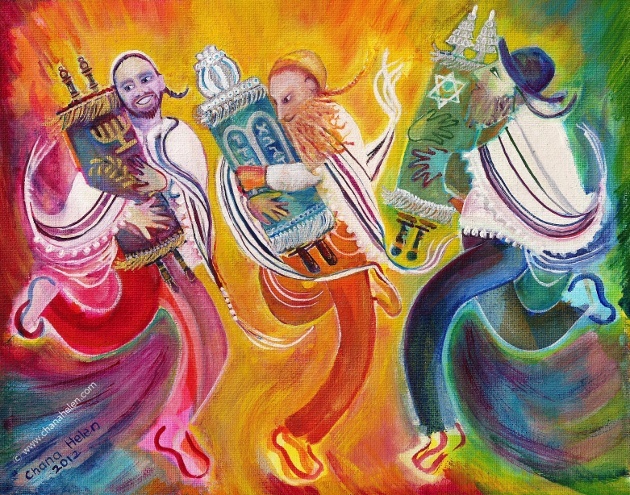 On Shavuot we immerse ourselves in Torah study all night but on Simchat Torah we rejoice without even opening the Sefer Torah; we keep it rolled up, covered, we just dance with it. The Lubavitcher Rebbe distinguishes between these two celebratory modes.Torah study differentiates between individual Jews. It is entirely dependent on each person’s intellectual ability. Some will study and understand more, others less. But no one person is able to grasp the infinitude of Torah. Despite our best efforts, our connection to Torah through study on Shavuot remains relatively limited. Simchat Torah presents the opportunity for every single Jewish person, scholar or illiterate, to forge a direct, arational, primal connection with Torah. It is precisely because the celebration does not involve study on Simchat Torah, because ‘it takes no brains to dance’, that the ritual of dancing becomes an equalizer among all Jews. Anyone and everyone can dance and this allows all Jews to forge a visceral connection with the Torah that transcends intellect. Simchat Torah demonstrates the fundamental bond between the essence of the Jew with the essence of Torah. Embracing the Torah also does something else; It elicits love. A hug is not only an expression of affection, the very act of embracing itself has the ability to generate this emotion. Every parent experiences this truth when they embrace their newborn baby for the very first time. Embracing a Sefer Torah is no different. It engenders a deep love, not just for the sacred scroll itself, but for all that it represents. This is why I am passionate about celebrating Simchat Torah through the ritual of dancing with the Torah rather than through studying it. I cherish every opportunity to study Torah and do my best to assimilate its wisdom. But once a year I value the opportunity to forge a unique and direct bond with Torah by embracing it. To replace dancing with study is to squander the uniqueness of Simchat Torah and to deny women a most spiritually meaningful and uplifting experience.